For patients facing tooth loss or extraction, selecting the right tooth replacement for your smile can be a challenge. At So-Well Dental Associates of Chicago, Dr. Zenobia Sowell and her team offer comprehensive implant dentistry as a permanent, aesthetic alternative to traditional dentures and partials. Dental implants are surgically placed dental restorations designed to precisely mimic natural teeth. 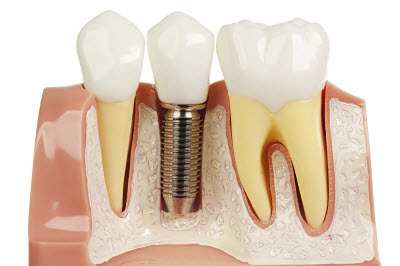 Composed of a titanium post, a connective abutment, and a porcelain or other tooth-colored restoration, implants are anchored into the jaw bone. This allows dental implants to interact with the bone, similar to natural teeth, so patients can enjoy a stabilized, lasting restoration. As dental implants are surgically placed into the jaw, this innovative treatment can be used to support the replacement of any number of teeth. For patients missing one tooth that is surrounded by healthy neighboring teeth, implants present the ideal alternative to bridges. Likewise, multiple implants can be used to support more extensive restorations. In some instances, additional treatments are needed to prepare the jaw bone for successful implant placement. Often recommended for patients with deteriorated bone density, oral surgeries such as bone grafting, sinus lifts, and ridge augmentation are incorporated into the larger treatment plan. At So-Well Dental Associates, the dental implant process begins with a comprehensive consultation with our Chicago implant dentist. During this evaluation, Dr. Sowell will look at every part of your dentition including the underlying bone to determine whether dental implants are the most effective solution for your smile. After creating a treatment plan and thoroughly discussing each phase of care with the patient, implant placement surgery is scheduled and completed. In the event the patient requires bone preparation for greater implant success, these preliminary treatments performed before the implant placement procedure. Throughout the subsequent recovery period, patients return to our dental practice evaluation to ensure that the implants are properly integrating into the bone. Impressions of your dentition are also taken and used to create your final implant-supported restoration. Depending on your dental health needs, this can be a single crown implant, an implant-retained bridge, or even an implant-supported denture. At So-Well Dental Associates, certain patients may also be eligible for All-on-4 implants, a specialized full-arch bridge that can be placed at the same time as the implants. Dental implants are widely used today as a way to restore individual teeth or partial bridges, and they are proven to last. Implants themselves are made from titanium, which bonds with the bone in your jaw over time. The dental restorations affixed to the implants are generally made from porcelain and acrylic. Unlike other restoration options, dental implants do not need to be removed to be cleaned, and they leave the palate open, restoring your sense of taste. Here at our Gold Coast dental practice, we offer provide your All-on-Four implants with Teeth-in-a-Day and have you out the door with a full set of teeth. This implant-supported procedure is one of the most advanced dental techniques available to patients. During this treatment, entire dental arches can be replaced and supported by just four dental implants. Whether you have decaying teeth or have been wearing dentures for years, All-on-Four can replace unsightly teeth and secure difficult dentures with a set of natural-looking, beautiful teeth. When providing All-on-Four implants, Dr. Sowell and Dr. Coakley work closely with patients to decide the proper dental treatment for their mouth. In addition to restoring the beauty of the smile, All-on-Four implants helps preserve jaw placement, ensuring patients retain proper bite. Often, patients with multiple missing teeth or those who have worn dentures for an extended period of time experience bone loss, which can in turn create premature wrinkles, weaken facial structure, and creates a sagging appearance. Replacing multiple teeth with All-on-Four implant treatment not only helps reinforce bite strength, but also helps stimulate bone regeneration, helping patients avoid these unpleasant side effects that come with dentures and extended tooth loss. By replacing dentures with this advanced implant option, patients can enjoy restored confidence, function, and aesthetics. Our Chicago dental team is committed to helping all patients find the right restorative solution for their smile. If you are considering dental implants as a means of replacing one or more missing teeth, contact Dr. Sowell today to schedule your complimentary dental implant consultation. Located on southwest corner of Clark St. and Elm St. in Chicago, So-Well Dental Associates welcomes patients throughout the city and Near North Side.